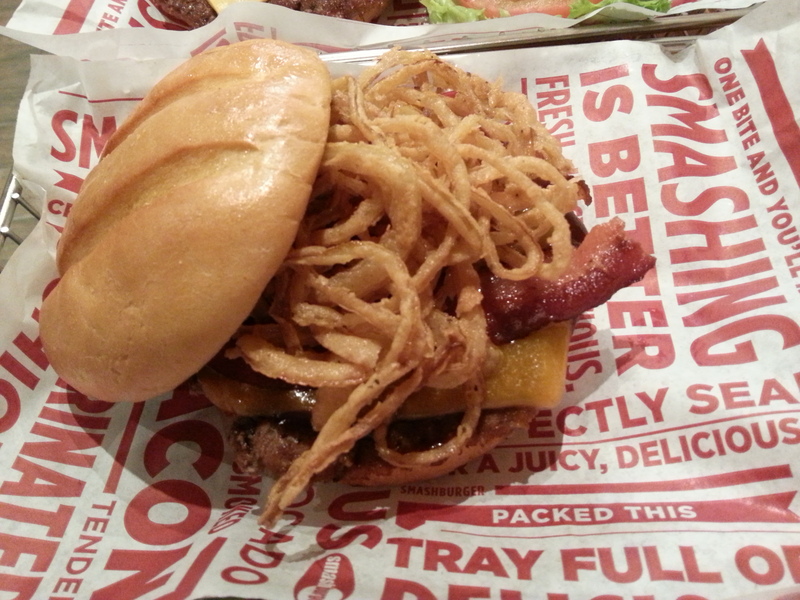 A Cause for Celebration: Smashburger is Now Open in Durham! 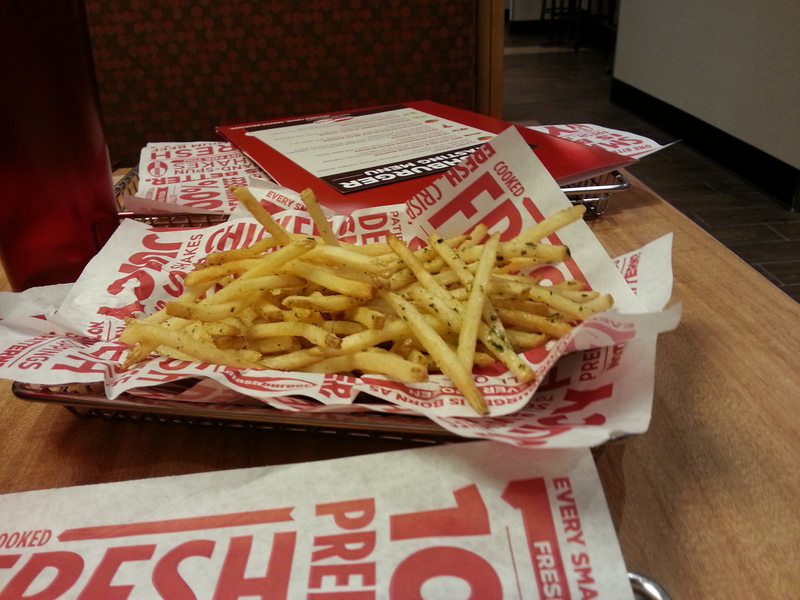 Smashburger opened a new restaurant on 3/12/14 in Durham, N.C. (2608 Erwin Rd., 919-237-1070, across from Duke University) and I was invited to attend a media tasting event the night before. This meant I had to abandon my current no-red-meat diet for a day and also review a chain restaurant — oh, the things I do for this blog. But I am so glad I jumped off both wagons, because by the time I left, I was in one of the happiest food comas I’ve experienced in quite a while. 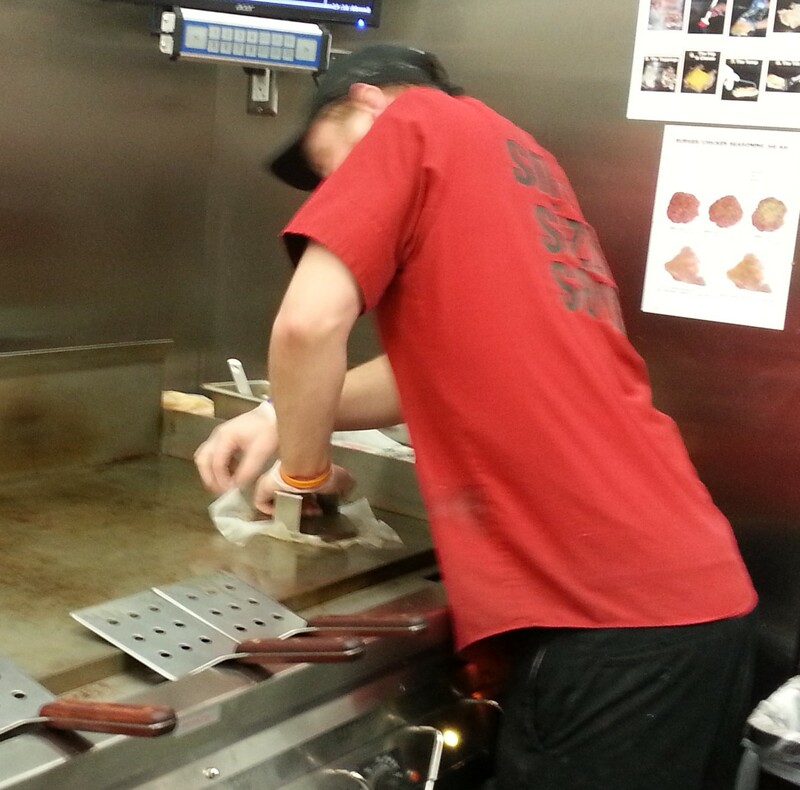 There are more than 250 Smashburgers in the U.S. and beyond, and that number is steadily increasing. 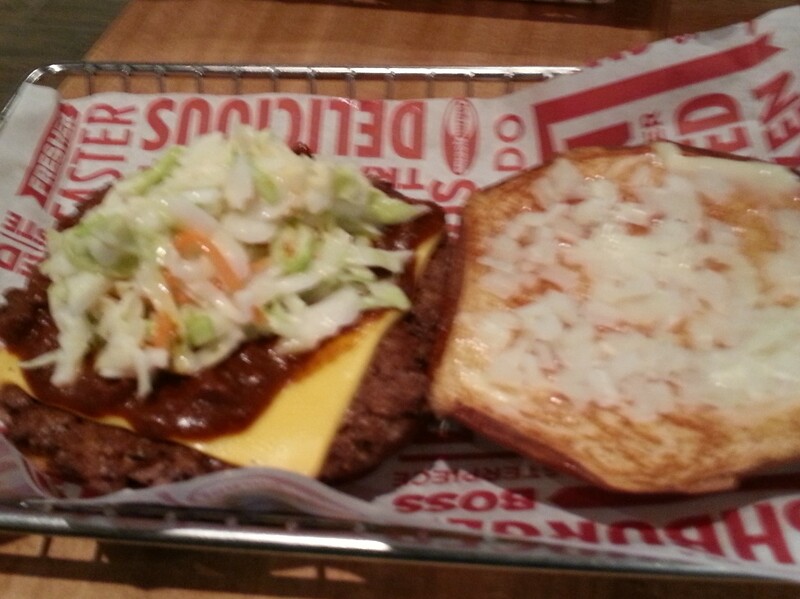 Instead of going into the history of this promising franchise, which is probably going to take away some of the market share from the big three burger chains, let me direct you to Smashburger’s website at https://smashburger.com/and I will concentrate on what’s most important — the food! 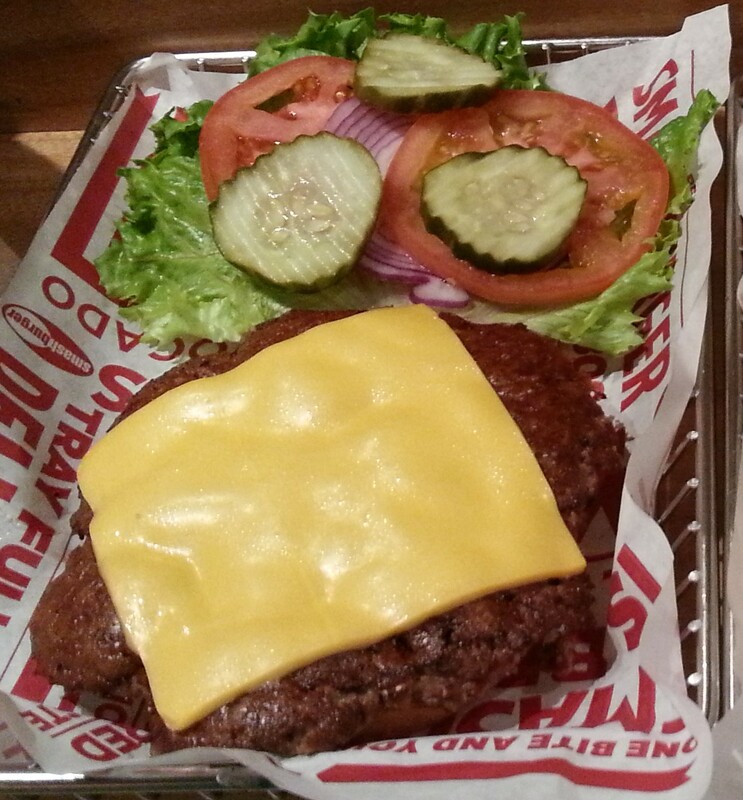 Smashburger’s burgers are crafted from fresh certified Angus Beef that is delivered several times a week to each restaurant. 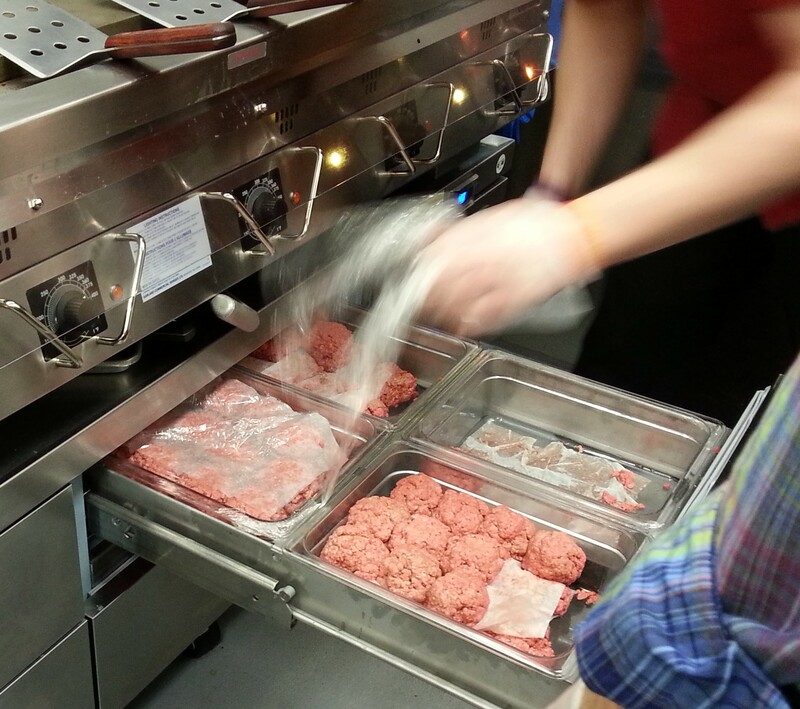 It is formed into balls, which are “smashed” on a hot-buttered grill to sear the burgers and seal in their juiciness. They are then seasoned and cooked for a couple of minutes, which results in total burger heaven. 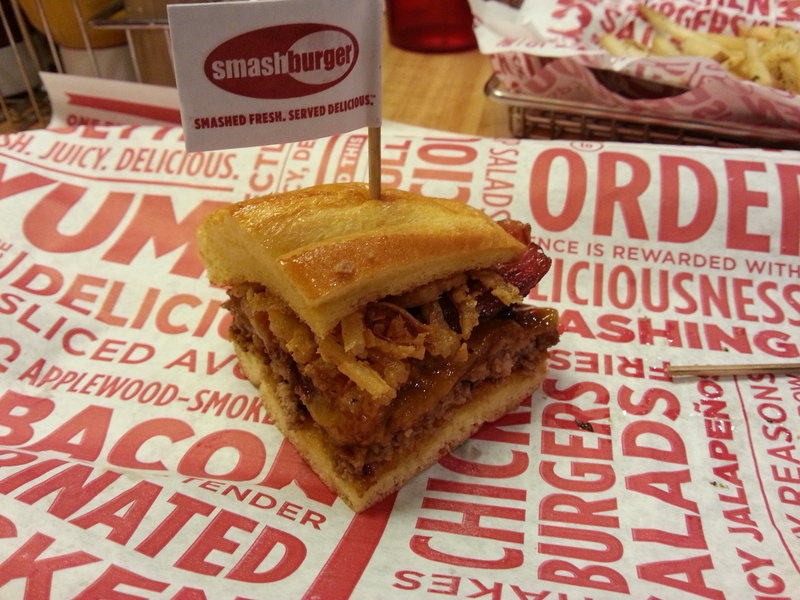 Smashburger’s goal is to be fast casual with an emphasis on fresh ingredients. The chicken is marinated and prepared “piccata” style – pounded thin with a wooden mallet so it will cook quickly. I’m not sure how this bird is marinated, but it is so good and I would love to have the recipe to make this at home. 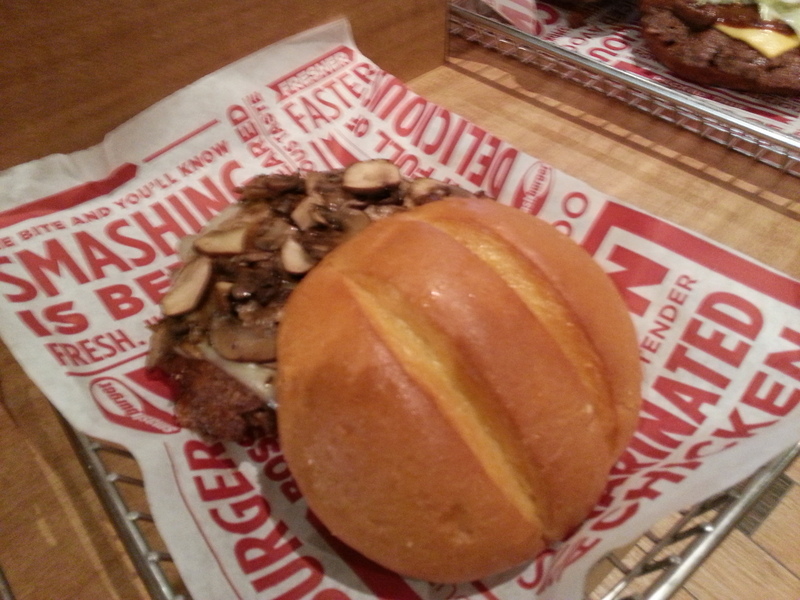 Smashburger’s buns are served toasted and include four choices: egg, pretzel, multigrain and spicy chipotle. They are made in a bakery in Chicago and shipped to each restaurant. I am tied between the egg and the pretzel buns — you can’t go wrong with either one. Okay, on to our tasting menu, which consisted of four signature burgers, a veggie black bean burger and two chicken sandwiches. In addition, we got to sample a number of the sides/fries and a to-die-for Häagen-Dazs ice cream milkshake that I’m still craving as I write this. Here’s a description of what we were offered. The sandwiches are in order and the fries and sides were served before and throughout the tasting. BTW, we only ate a portion of each sandwich. I would still be comatose otherwise! Classic Smash. American cheese, smash sauce, ketchup, lettuce, tomato, pickles and onion on an egg bun. This may have been my favorite — just great, classic toppings with the wonderful flavor of the meat really shining through. Yum-o! BBQ, Bacon & Cheddar Burger. Cranberry BBQ sauce, applewood-smoked bacon, cheddar cheese and haystack onions on an egg bun. Love the bacon, cheddar and especially the haystack onions on this one — they are crispy and so good. I thought the BBQ sauce was a bit sweet, which probably means Gabe and Lexi would love it! Truffle Mushroom Swiss Burger. Truffle mayo, sautéed crimini mushrooms and aged Swiss cheese on an egg bun. This one is definitely for the mushroom lovers in the world, myself included. They are cooked and seasoned perfectly and complement the burger rather than overpowering it, like other mushroom burgers tend to do. Definitely a favorite. Avocado Ranch Black Bean Burger. Fresh avocado, pepper jack, lettuce, tomato and ranch dressing on a multigrain bun. Loved, loved, loved this! Excellent spices in the black bean burger, including cumin, which I love. Avocados were fresh and are always a great topping for a black bean burger. Chicken with Spinach, Cucumber & Goat Cheese. Cucumbers, spinach, goat cheese, tomato, onion and balsamic vinaigrette dress this chicken sandwich on a multigrain bun. Goat cheese, people, goat cheese! And the balsamic vinaigrette is a perfect dressing for this. Avocado Club Chicken. Fresh avocado, applewood-smoked bacon, lettuce, tomato, ranch dressing and mayo on a multigrain bun. Bacon and avocado, need I say more. Except don’t make me choose between this chicken sandwich and the one above! The sweet potato fries were fantastic — hot and crisp with just the right amount of sea salt. The Smash fries were yummy as well — shoestrings with garlic, olive oil and rosemary. 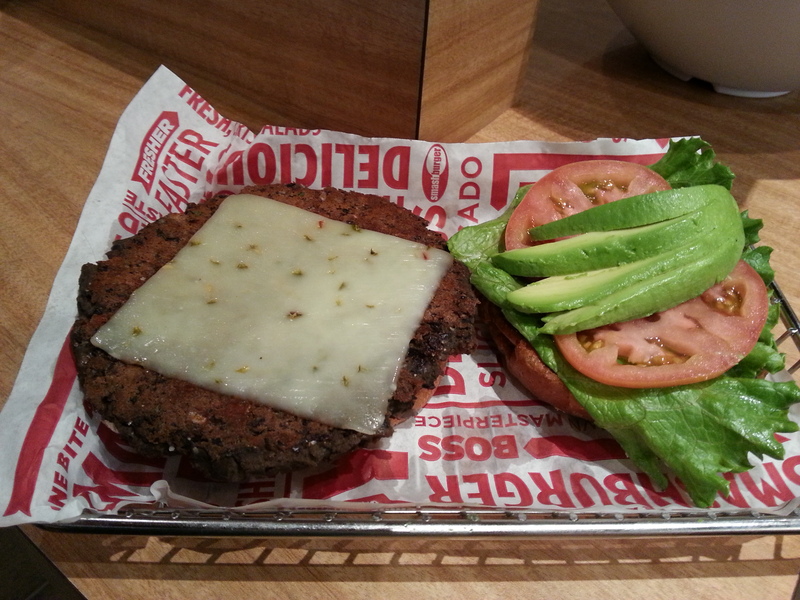 Not interested in any of Smashburger’s signature offerings? That’s okay, feel free to design your own! 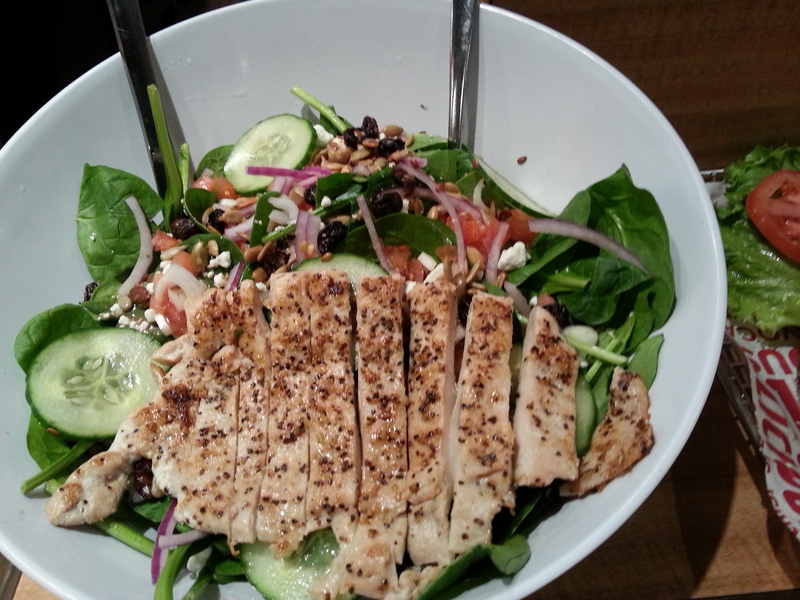 Or, if you want to be a bit healthier, Smashburger also has huge salads that include the fresh ingredients offered on its sandwiches. Don’t forget that awesome Häagen-Dazs ice cream milkshake I mentioned earlier (and I’m still craving!) Ours was made with sea salt caramel, but you can also indulge in Oreo, Nutter Butter, Butterfinger and more. Durham franchise owners are Ketan and Jayshri Patel, who have deep roots in the Triangle and were delightful hosts for this event. Ketan has a Master’s degree in Management from NCSU and Jayshri earned her Executive MBA from Duke, and each has worked in their respective fields in the area for more than 25 years. 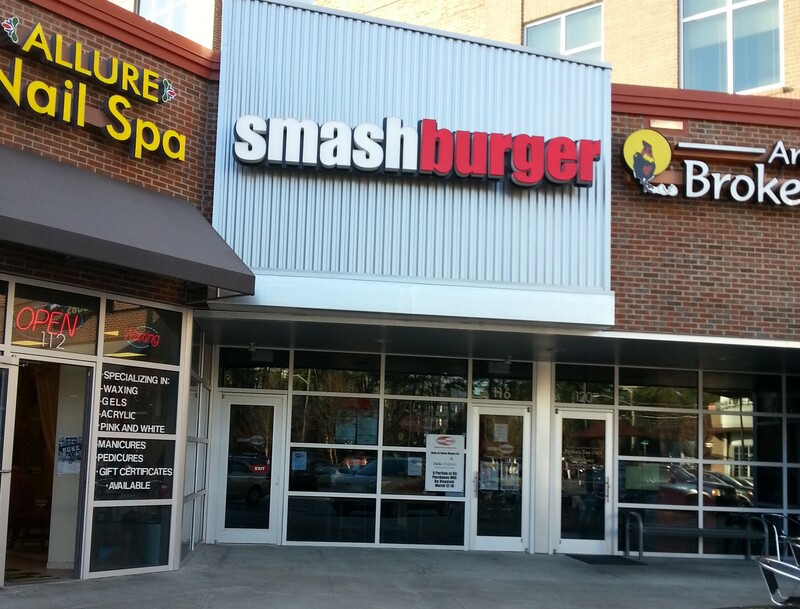 I’m glad they are now setting their sights on the restaurant world, as they are planning to open several more Smashburgers in the Triangle area. I hope their next one is close to my home! 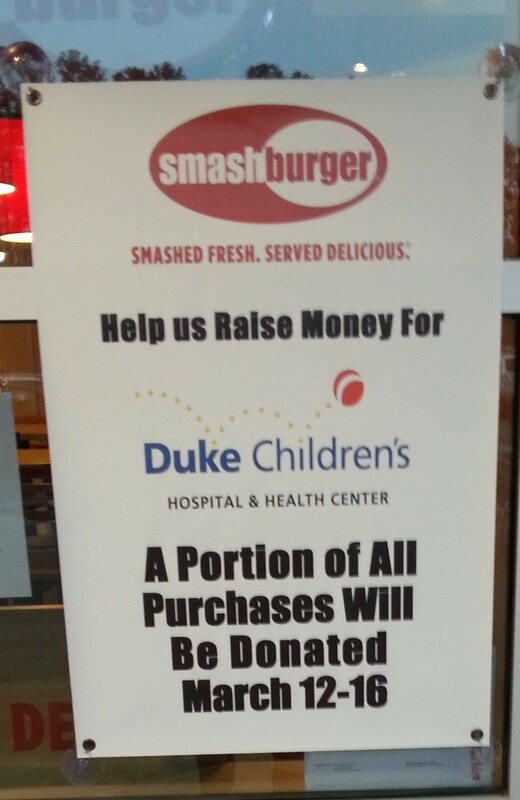 Ketan and Jayshri are donating part of their proceeds (from March 12-16) to Duke Children’s Hospital & Health Center. Now that’s what I call an excellent way to start a new business! 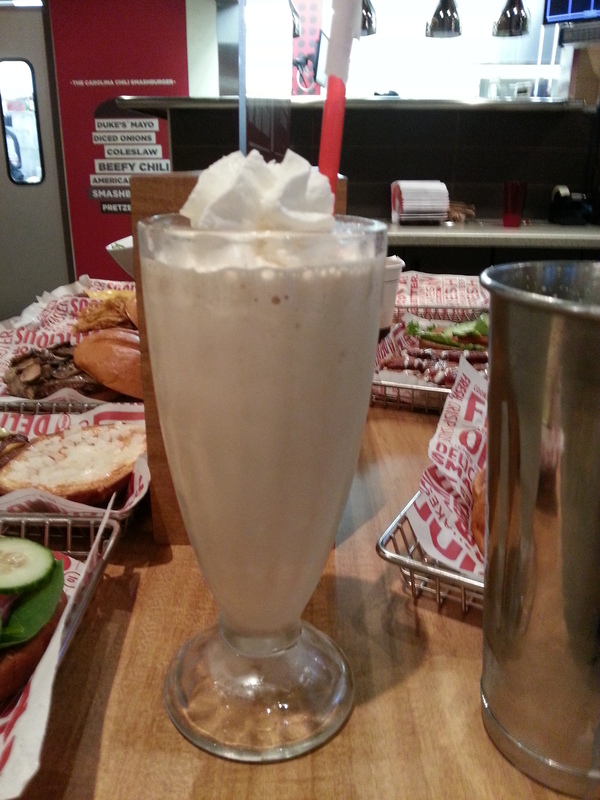 This entry was posted in Restaurant Reviews and tagged Best burgers Durham NC, burger reviews Triangle NC, eat drink and be merry, Kel's Cafe Smashburger review, Kelley Chisholm restaurant reviews, Smashburger Durham NC review. Bookmark the permalink. 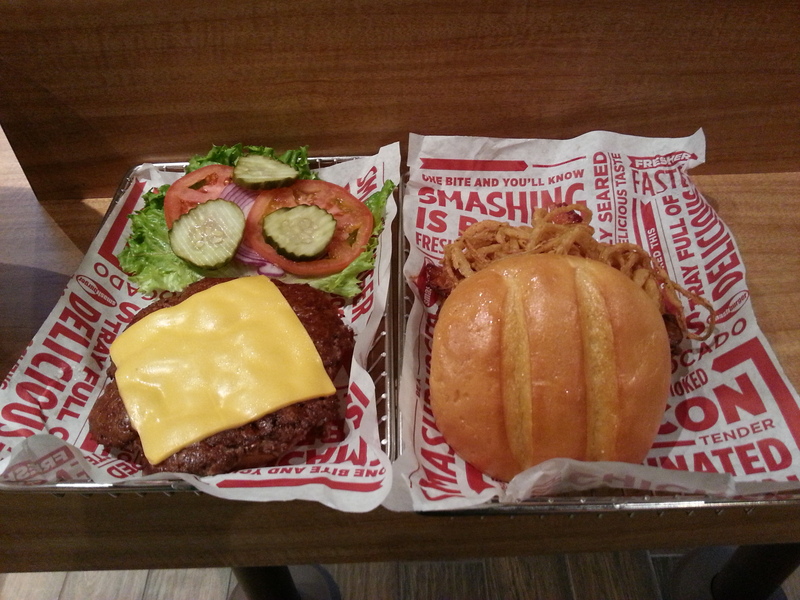 4 Responses to A Cause for Celebration: Smashburger is Now Open in Durham! 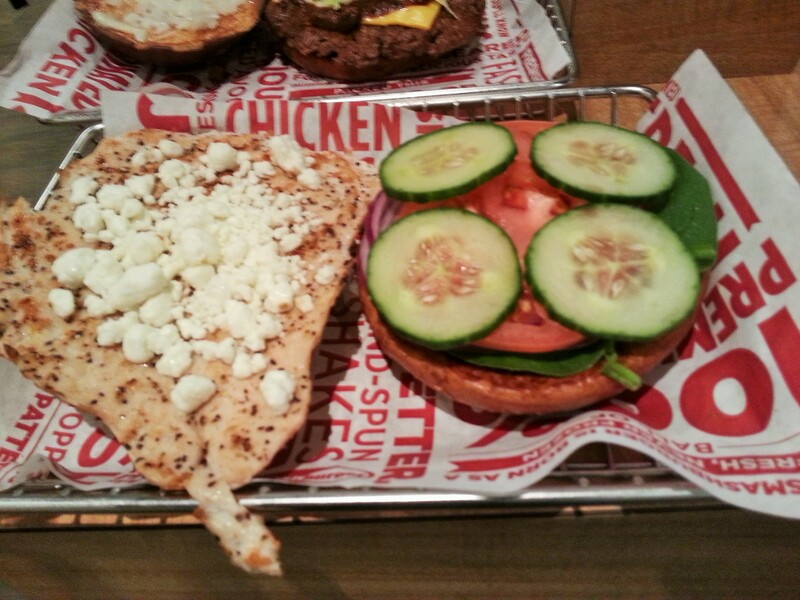 Hello Kelley, it was a pleasure having you at Smashburger! What a wonderful story and fantastic pictures! Thank You So Much….Jayshri Patel. I was glad to be able to attend and hopefully some of my Duke and Durham friends will give your place a try (I know a few that already have.) Loved the food and look forward to you opening a place in Raleigh!